When you get married what is one thing that goes through your mind? The date, the venue, the reception, the tux or dress. I don’t know a lot of the general public gives underwear a thought. Well on the men’s side of things. It’s grab what’s in the drawer that day. Gay weddings sometimes i hear of grooms matching undies, but even then it’s rare. There have been pics I have seen floating around the internet for the last few years. 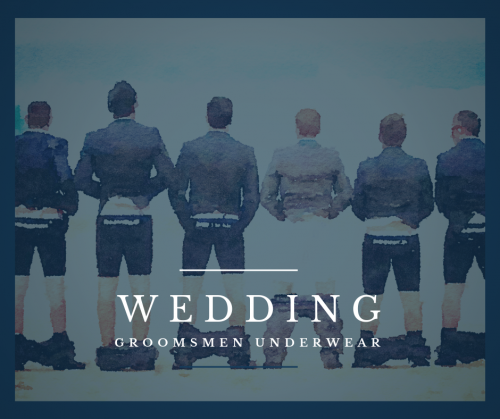 They are wedding pics of the Groom, Best Man, and groomsmen wearing undies that say which one they are on the back. This, I think is more of a straight thing. I haven’t seen this at many gay weddings yet. Related Undergarments have been posting a few of these pics on their website. I personally think these are super cool pics. Guys dressed in their tuxes with the pants pulled down is just awesome. I know I may be in the minority on this one. In order to do this you have to have the right group of guys. Guys that are going to be ok, dropping their pants and showing off for the world. I hope we see more of this but I guess time will tell. Would you do this on your wedding?